I was attempting to learn more about LN and came across the post below. I also made a picture of my interpretation of the instructions. 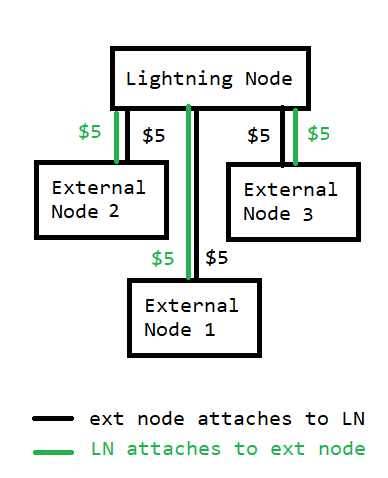 In it, the suggestion is made that Nodes 1, 2 and3 connect to the his own (main) Lighning Node. The purpose of this exercise is for Nodes 1, 2, and 3 to "gain access to the Lightning Network" altogether. I was wondering if this would not be an exercise of futility (since the channels are funded with such small amounts). Channel balances on the Lightning Network are denominated in millisatoshis. $5 correspond today to roughly 0.001 BTC or 100,000 satoshis, so even a channel funded with only $5 could facilitate a number of small payments back and forth.